Nidhogg 2 is a near perfect, hilarious fighting game – AiPT! If you had asked me what my favorite thing about PAX East was a few years back, you’d probably expect a breathless diatribe about an amazing upcoming game, or how great it was to see CD Projekt Red in person, and have them sign my Gwent cards. You’d be right. The Gwent thing was amazing. Still, right there in second place, shocking everyone including myself? 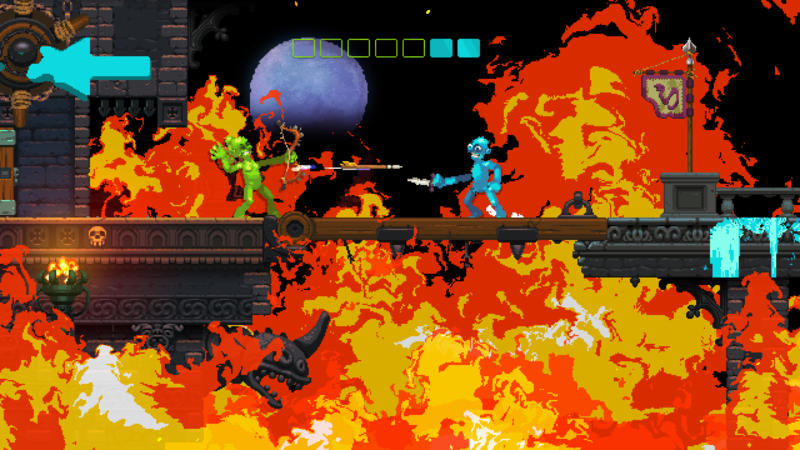 Nidhogg 2. Of the time spent on the show floor, the only thing I can remember is the hours, LITERALLY HOURS, I stood there to play and watch and cheer while people stabbed, shot, slashed, and stomped on each other to get eaten by a giant worm. The booth was so packed and loud that on several occasions the enforcers had to disperse us, as we were blocking two lanes of traffic. The game was just a goddamn blast to watch, and everyone was getting into it like a boxing match, yelling at crazy hits and kills, and sudden shifts in the momentum. When I finally got a chance to grab some plastic, I was right there in the mix, seconds after starting, holding my own and battling my way to a win and a worm snack in a few minutes. I was hooked. I had to have this game. One problem – only on PS4 and PC, and I’m the unabashed Xbox fan of AiPT. Ah well I said to myself, I bet they’ll throw me a port at some point, or maybe I’ll snag the PC version. Spoiler Alert – MY XBOX DREAMS CAME TRUE! The skill level? Incredibly low. Yes there’s some level of timing and skill necessary to stay alive, but luck is heavily favored in these match-ups because of how god-damn fast everything goes. You are literally sprinting to get to the end, and I’ve won many a match by just jumping over my opponent, and racing him to the next screen. Still, it’s a tightly controlled game, with no rage quit moments due to lag or button timing. The fast paced nature helps here as well, as there’s literally no time to process anything – if you’re not fighting, you’re running and looking for your respawned adversary to start stabbing. Graphically, this game is weird as hell. The original was very Atari 2600 in its looks, with blocky characters and basic backgrounds. This art style, where your avatar is some mutated Simpson-esque character, in a variety of color choices, is amazing and so odd at the same time. Everything is touched by this, and is all the better for it. I feel like this might be what it looks like when Weird Al dreams, but Messhof successfully reinvents his entire indie debut with a very specific and instantly recognizable aesthetic. Overall this game is approachable and easy to pick up, and a hell of a lot of fun. Playing against my sons or my wife involved tons of screaming and laughter, as well as a great deal of self-control to not start dropping F-bombs in front of the youth when a great run is cut short. The only negative is that while there is a single player mode, with a slowly ramping difficulty when it comes to the computer controlled enemies, it’s still a very thin game overall. If you’ve got someone to play with on the reg, or have better luck than me, pre-release, trying to find a match online – you can get quite a few hours of enjoyment out of it. It’s not something you’re going to be coming back to all the time though, and that’s fine. It scratches a very weird itch, with a giant sword, and I couldn’t be happier. Is the worm worth it? While not the deepest of game, this is a fantastic fighter that you can play with a screaming crowd around you at home, or online cursing at an opponent, and giggling at the same time. Fun as hell. Pick up and play in a second, and it's a blast the entire time.